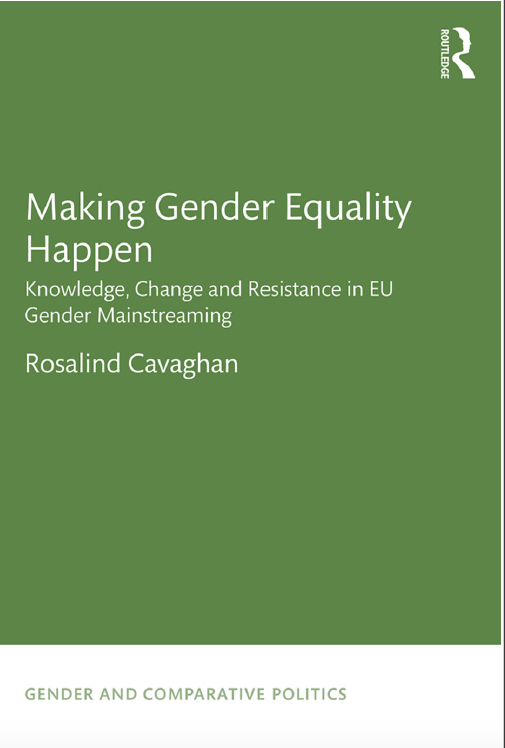 You are warmly invited to the launch of WiSE Post-Doctoral Fellow, Dr Rosalind’s Cavaghan’s book “Making Gender Equality Happen – Knowledge, Change and Resistance in EU Gender Mainstreaming” on Tuesday 19 September 2017 at 6pm in the Hamish Wood Building Conservatory. “This eminently readable and intellectually engaging book looks at the gap between official policies about gender equality …and actual changes” – Myra Marx Ferre. Alice H.Cook Professor of Sociology, University of Wisconsin-Madison. Most organisations and countries profess their support for gender equality, and the most popular policy to achieve this is ‘gender mainstreaming.’ But most people outside feminist circles haven’t a clue how to ‘mainstream’ gender and might be irritated by the very idea. ‘Making Gender Equality Happen’ starts with this problem and asks what needs to happen when everyone is so confused. In common with many staff at WiSE and GCU, Cavaghan has strong links with policy makers. Originally policy consultant, she describes her own initial difficulty understanding ‘gender theory’, opening her book with a description of a civil servant banging their fist on the table, telling her ‘there is no gender problem!’ Coming from the perspective of a policy consultant Cavaghan found this a pretty easy position to understand. Using insights from the Sociology of Knowledge however Making Gender Equality Happen explains the processes of learning and resistance underway when an organisation or government tries to implement gender mainstreaming. In this way, Making Gender Equality Happen, engages with practitioners’ experiences on the ground, illustrating why it can be difficult to put high ideals into practice in large organisations and how to predict and circumvent common implementation problems. 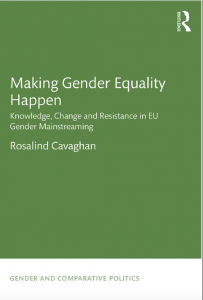 As such, Cavaghan’s book presents a much more optimistic and practical assessment of Gender Mainstreaming than many of her peers, along with clear ideas for how to make the policy work.